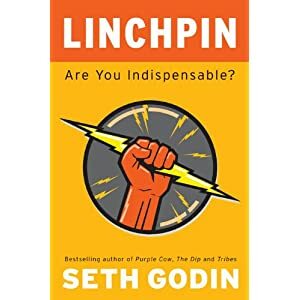 I recently finished reading Linchpin by Seth Godin. This is a great read and packed with insight. The full title is Linchpin - Are you Indispensable? I found the book from reading Seth's blog which I try and read daily but usually catch-up with it on weekends. The crux of the book is about how some employees are able to do anything. They are the go-to guys who seem to know someone or something that can get the job done and have the talent for making it happening. They are the linchpins. A lot of the book discusses art and the generosity on non-reciprocal giving. I've read a number of books like this lately and the one example that keeps on coming up is Wikipedia and I have to say that this example has been overdone many times. Perhaps it's still relevant and perhaps it's the largest and best known example of its time but I would like to see some other examples apart from Wikipedia. Seth is a big fan of shipping and doing so on time. He's right and to get a product to market you have to ship. Don't look for perfection or you will never ship.